Dolma is flown to Padar by the CIA, so Lupin and company make their own trip. There, the trio discover how half of the city they arrive in is highly technologically advanced, thanks to the IT company Shake Hand. The other half, controlled by the religious faction, is technologically behind. Meanwhile, Fujiko and Ami pay a visit to Shake Hand’s facilities before paying a visit to the low-tech part of town. 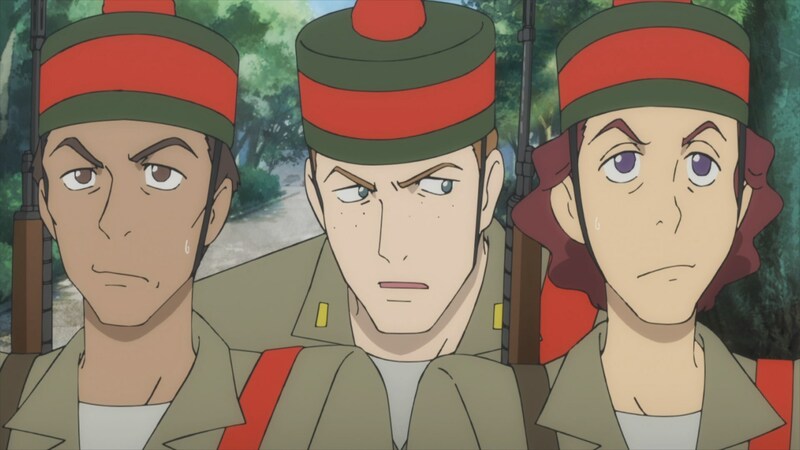 Meanwhile, Lupin and company nab a couple of Padar troops and print out face masks for Lupin and Jigen to wear. The duo go on patrol, where they discover that a military coup in favor of the local religion is in the works and is backed by the CIA. Fujiko infiltrates the religious facility with Ami to rescue Dolma and for Fujiko to grab the treasure. Meanwhile, Zenigata shows up after learning that Lupin has left a calling card with the High Priest. The High Priest isn’t worried but agrees to help. 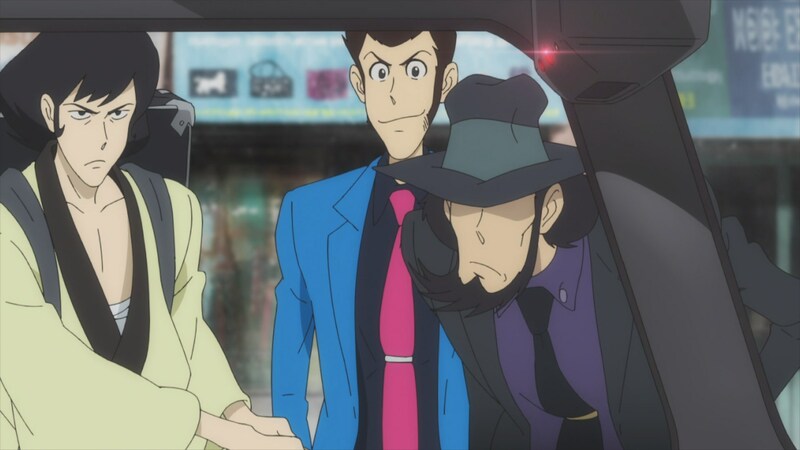 Zenigata turns out to be Lupin in disguise, who learns where Princess Dolma is being detained. The coup starts as Ami enters the part of the facility where Dolma is being held. There she runs into CIA Agent McGuire, who disarms her and starts choking her. Lupin shows up to save Ami. Lupin stalls until he can spring his trap and secure Agent McGuire in wire strands. Ami is happy to see Lupin, but their reunion is interrupted when Dolma comes downstairs. Lupin keeps McGuire covered, but is stunned when Dolma shoots him with an arrow. Heh. 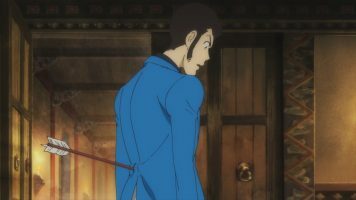 Lupin the Third Part 5 – 14 sees Lupin get shot again. 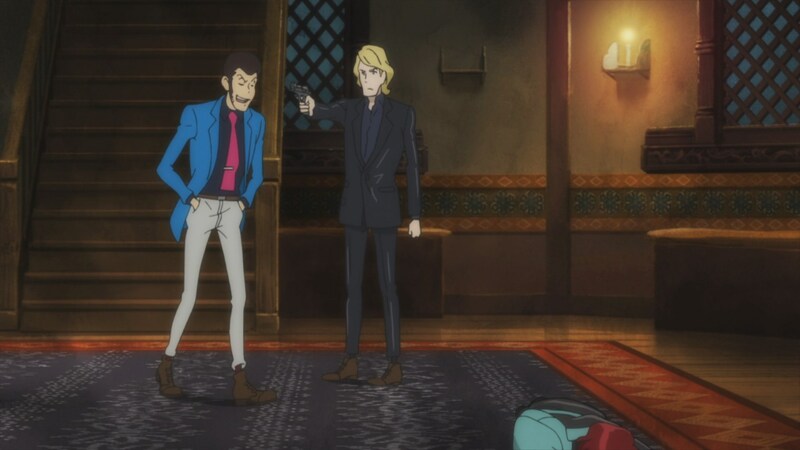 I guess the production team wants to punish Lupin. 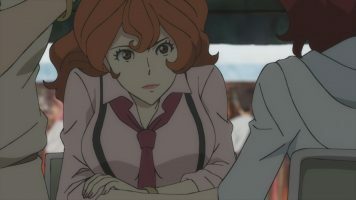 I found it to be rather fun having Ami paired up with Fujiko. Ami knows that Fujiko can’t be trusted, yet Fujiko is her best bet for saving Dolma. 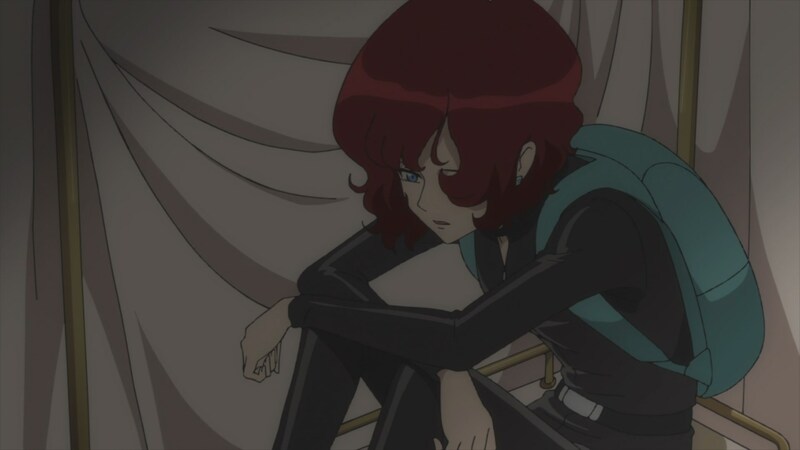 I was kinda hoping that Ami would tell Fujiko the reason she dislikes Lupin’s former girlfriend so much. I wouldn’t be surprised if Ami has a little crush on Lupin. Fujiko knows that Ami’s skills will only help her get her loot. After infiltrating the temple, Fujiko disappeared. Not really sure what happened with her (and it has been a couple of weeks or more since I watched the episode). OK, so we have this religious sect that apparently hates technology and capitalism, yet these bastards are totally cool with using the tools of technology and capitalism to stage a coup in order to take their country back into the dark ages. I know this stuff happens even now (Afghanistan for example) so it isn’t an unrealistic thing for the antagonists to do. However, I’m not sure why the CIA would bother to back a backwards thing. Dolma’s betrayal was both surprising and expected. 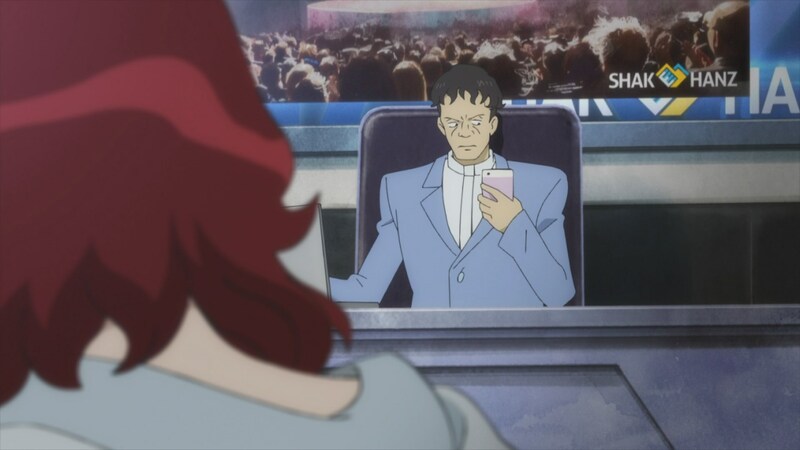 I expected that she’d help the coup, maybe not so much because she was anti-technology, but because she thought it would be the better thing to do for her people. 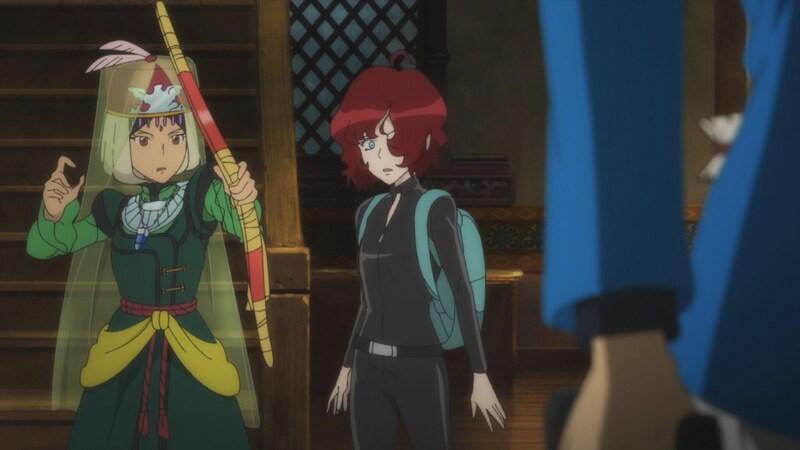 I didn’t expect her to shoot Lupin with an arrow though. 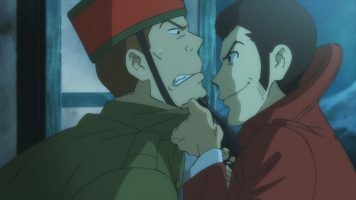 That aside, I was amused at Lupin’s use of a 3D printer to make his masks to infiltrate an army base as a soldier and then later, the temple (as Zenigata). It made me wonder if the original series ever bothered to explain how Lupin had so many masks. Ugh. I really have fallen so far behind, so let me wrap up the review of Lupin the Third Part 5 – 14. I remember as a teen, a driverless car like K.I.T.T. was cool. But then K.I.T.T. obeyed and did what he was told. Lupin the Third Part 5 – 14 reminded me of how actual driverless cars may obey to take you to a destination, but they “rule” the humans they transport. That’s why I don’t like the current tech. I wonder if Zenigata will actually get involved with this story. In the end, Lupin the Third Part 5 – 14 is a pretty good episode in a story that has me fairly interested. Here’s hoping it isn’t another two weeks or more until I get the next review going. ? Personally, I can’t wait to see how Shake Hands will figure into the final story arc of the series. 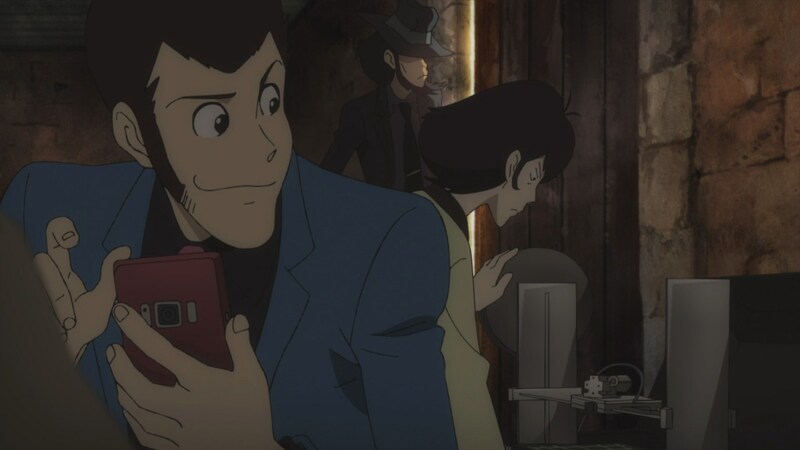 Goemon and Jigen are high-tech illiterates so I am guessing that Lupin and Ami will be the ones to take them down. I’ve got to keep watching! 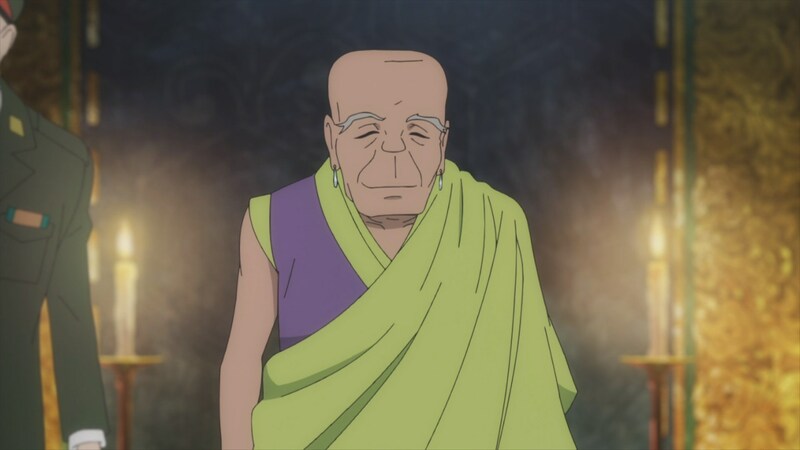 These last three “one shot” episodes were easily the best of this series. Something to look forward to. ?